Finally, I have a decent internet connection to update my blog. Our internet is temporarily disconnected and it makes me very sad, almost miserable. Hahaha. Anyway, nothing much has happened in my life as of the moment. Time goes by so fast, everything is such a blur. Okay, so this post is gonna be about (of course) the four-letter word that starts with F. FOOD. Hehe. I'm happy to have spent time with my friends from work other than inside the four walls of our building. We decided to have breakfast at Glorietta that morning. Though we were not complete, we still had a great time! It was a choice between Pancake House, Max's and Subway since most food joints were not open yet at that early in the morning. 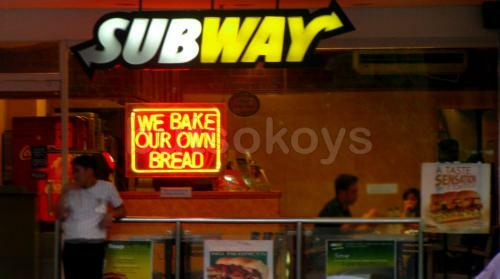 Subway it is! Majority of us haven't tried it. What a shame right? Subway has been around for so long and yet I never even considered trying it ever. Me and Zel ordered Subway Melt and a 6-in Egg and cheese sandwich. Yumyumyum! While Randy and John ordered a Subway Melt as well and the spiced ham variety. I love how you can customize your sandwich here! From bread, dressings and garnishes! I wish they could toast the sandwiches a little more. But all in all, it was very delicious and fresh. I cannot even fathom why I haven't thought of eating here! Fast, delicious and fresh food indeed! After enjoying our food here along with our stories and laughter, we thought of watching Underworld 3. I told them we don't really know when we'd be able to go out again so might as well make the most out of the day. I guess they saw the sense in what I said, haha! But boohoo! Underworld's first screening time that day was 1:15 pm and we just couldn't do it since Zel had a shift later that night. So we ditched the movie plans and snacked at Auntie Anne's (I told them great friends that I haven't tried the pretzels yet, insert awed expressions in chorus here). I am so in love with Auntie Anne's! 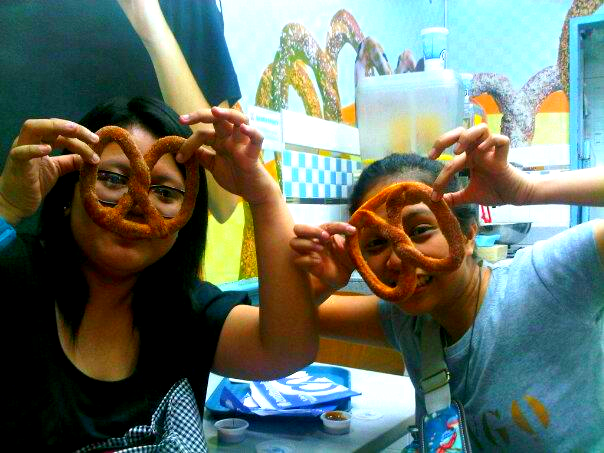 I knew that these sweet pretzels will always satisfy the cravings of the sweet tooth in me! I loved that the pretzels were served fresh and hot off the oven! Smells heavenly too! And it has exciting flavors that I can't wait to try. I am so glad I finally tried Auntie Anne's pretzels! Hehehe. We spent quite a long time there just laughing the morning away. Glad that the food attendants there don't mind our boisterous laughter! Hahaha! Yey! Looking forward to more bonding time with my team mates. With all the changes that are happening in our account right now, we'll never know when we can go out again.